God Heals In Different Ways, Sometimes He Shows Us The Way, But Praise God I Am Healed. Testing shows no Cancer!!!!! Must See! When I discovered that I had bladder cancer I knew God would heal me, for He has done so in other occasions. But it seemed that everything was falling apart, since the day we launched the part of the ministry geared to rescue Jews. My life being threatened was nothing new, but the frequency of the threats was. The wed site came under the heaviest attacks my server has ever seen. Hackers became unrelenting on getting into my computer. Personal attacks came from many who call themselves "Christians" telling me I had not heard from God. And our finances came under attack like never before hurting the other parts of this ministry here in Israel. But I had heard from God and had put my hands to the plow, and I knew I was to go forward Believing God and not man. But what I want to talk about now is the bladder cancer, for what I have learnt may help many others as well. Bladder cancer seems to effect more men than women, and kills tens of thousands ever year. As you know when you get sick it puts you on real serious praying grounds with God. But what I have discovered is a cure for cancer not just bladder cancer. But more than that it’s a way to cure, treat and get rid of nearly any sickness in your body. I know it sounds to good to be true but just doing some investigating on your own and you will quickly come to the same conclusion. I have nothing to sell here I just want to help as many as I can with this experience I have just went through with the Ruach Ha Kodesh as my guide, God needs us healthy. It all began with what I thought was a bladder infections, not ever having one I didn’t know what to expect. I went to the doctor and he ordered urine and blood tests. The Urine came back with blood in it. Then he ordered an ultrasound, and it showed that I had multiple tumors in my bladder that had to be surgically removed. (Cancer) I checked into the Hadassah Hospital in Jerusalem. They gave me a spinal and the operation that was only to take 30 to 45 minutes took two hours. But that wasn’t the only bad news, the Doctor said he could not get all the tumors and would have to do it again in three weeks. He sent me home and on the second day my bladder blocked, a very painful ordeal and I had to return to the hospital and have the catheter put back in. He also ordered a series of X-rays where I had to have a shot of some type of dye before the X-rays. They showed that there were still tumors but the cancer had been retained in the bladder and had not spread to other parts. Three weeks passed not near enough time for healing inside my bladder, I was still passing blood but I was back for the second operation, same routine spinal and a much longer operating time than expected. The Doctor came to me after the operations and said he thinks he got them all this time. But said we must wait on the Pathology report in a few days. The news that came was not good, it said I have one tumor left and it was high grade that had rooted in the muscle of the bladder (a very bad one) and now they needed to remove either part or the entire bladder this time, major surgery. It was then I heard from God and He said no, as simple as that God said no more operations. I know now that God allowed me to have those two operations because they were nothing more than burning off the tumors much like they do skin cancer but inside the bladder. But now he was talking about major surgery, and one that could alter my lifestyle in a big way, hindering the call of God on my life. I ask the doctor what would happen if I didn’t have this operation and he told Connie and I that I would have less than a year to live, and it would be a miserable painful death. But I heard God very clearly and He said no more operations. So I told the doctor that was enough I will believe God for my healing. You might know how happy that makes a doctor. What I might say at this point is the first two operations were rather simple straightforward and I felt God wanted me to go forward with them, as my bladder was cluttered with tumors and surgery was the quickest way to get rid of them. But now I felt God would just heal me with His touch as He has done for me in the past. But I had something else to learn about God at this point. The doctor ordered a CT Scan and the results of this X-ray showed the remaining cancer to be a killer and one that must be removed as soon as possible. But I heard God say no more surgery. A friend of mine who is a Doctor also a Messianic Jew told me I was making a mistake, that I should have the surgery. But again I had heard from God and he said no. Connie knew I had heard from God and that settled it. God came to me and told me that He needs me to be in perfect health and it was time to clean out the temple for future use. I don’t know what the future holds, nor what I will have to do but I need to be stronger than I had ever been. That my body like that of most of the human race was polluted and unable to fight off diseases as it should. That in the days to come many will be depending on those who He sends to be strong and not sick I had been breathing polluted air, eating chemical treated foods depleted of most of their minerals and vitamins contents for nearly all my life. Drinking polluted water with chlorine and other chemical all designed to decrease your immune system making our bodies unable to fight off disease. It was time to clean house, and get serious about it. At this point (about two months ago) I started being led by the Spirit to read certain material on health and cancer cures. What I have discovered can save a lot of lives and there is not one person reading this it would not help. For it is doubtful that many reading this has the proper amount of oxygen in their blood, or the right balance of minerals, vitamins or enzymes. I was first led to a Book by Ed McCade "Flood Your Body with Oxygen" Connie and I both read the book and both were amazed of its contents. We were also like others very upset with the Medical profession that is killing hundreds of thousands every year and they know it. But I will stay away from that for now. But after reading Ed’s book you will not help but be very upset with how cancer and other diseases are being treated, motivated by money and not the patients welfare. For they are treating the tumors and not the cancer. They know the cure lies in proper nutrition and getting oxygen into the cellular level, in the blood. Not just oxygen but activated oxygen "Ozone". But Doctors are not trained in the field of nutrition and Oxygen Therapy. They are trained to prescribe drugs, chemotherapy and Radiation that kills more good cells than cancer cells, and damage the body even worse. If they do get rid of the tumor it isn’t long before the cancer is back, this time the body has no immune system left to fight and the patient dies. The same routine is played out a million times throughout the US every year. What is criminal is Doctors know what they are doing is wrong but dare not buck the FDA who is tied into the Pharmaceutical giants that control it all. In Germany and other places in Europe they have a 96%+ cure rate for cancer by using Oxygen Therapy along with others cures such as B-17 (Illegal in the States). They have learnt that cancer is cured by nutrition and by flooding the body with oxygen. But they are not allowed to prescribe it to their patents in the US. But when a Doctor gets sick they usually take a trip to Germany, Mexico, or Russia and get their cancer cured right away. All the millions of dollars the Pharmaceutical Companies are putting out for cancer research is a joke, they are only trying to make new drugs to sell, and they already know of the cure, but it’s to cheap, it’s called oxygen, they just can’t make billions on oxygen. Three months have passed and praise God my bladder functions are completely normal, my health is good and getting better daily. It hasn’t been easy for I’ve been aggressively doing detoxification both with a product called CELLFOOD and B-17 and lots of other things. The cancer fought back very hard, but with a new and very strict diet and lots of Oxygen, with a product called CELLFOOD it lost and once again God is victorious, for it is He who has directed my fight against this cancer. The trick is to get the Oxygen into the cellular level. Cancer cannot live in the presence of oxygen; it’s as simple as that. What is actually happening you are building your immune system so strong that a disease cannot survive in your body. In the process your blood turns from a dark red to a cherry red, as it becomes rich in oxygen, your energy level goes up and you feel great. So instead of going after the tumor you went after the cancer. In the process you become healthier and far better for the whole experience. 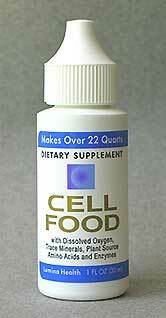 Every human on earth needs to be taking a product called CELLFOOD there are lots of sources for this product but there are also lots of imitations so I am going to give you a link it’s the place I purchase mine and it has saved my life. www.cellfoodusa.com If you will tell Diane that I sent you, it could help me out some. I could give you a mile long sales pitch for this stuff, but I will just say it will make you very healthy and you will be forever thankful I told you about it. I should also add that I drink around one litre of Colloidal Silver every day, but not just any CS but the highest grade you can possibly make or buy. And I recommend the model SG6 by SilverGen http://www.silvergen.com/ Tell them also that I sent you for a discount. So once again God healed me, this time however He did it differently than before. He showed me how to make myself healthy and ready for the ministry He has set before me. It took cancer to get my attention, what will it take to get yours. Now I know we must go forward in preparation for the ministry God has given us. For as the way opens throughout Turkey and elsewhere and Anti-Semitism grows like a cancer only God has the answer, but He must send His Messengers and with His plan. Here in Israel much groundwork has been accomplished, one boat has been purchased and we believe God for the finances for the second larger boat to carry many more. As for me, God has just given me another victory in Him over another death threat on my life, this time by a doctor, for He is faithful to finish that which He has begun. In 37 years of Ministry never has there been such an urgency and importance as there is today on this Ministry for time is short and lives are at stake. Pray about your part in this Ministry, we need you today.